These look disturbingly like the Listerine Breath Strips. Wow. Fresh breath...and tumescence. What a bargain! OMYGOD that is sick. I thought for some reason that the Dr Leonard's ad was for a deodorant so I was shocked to see that it was for . . . tumesecence. 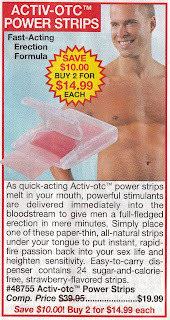 Like you don't get an erection from Listerine Breath Strips! C'mon! Well, face it... you're never gonna get laid with bad breath.